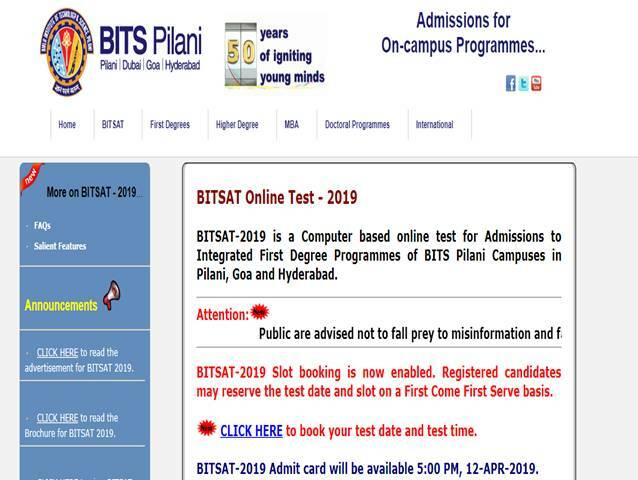 BITSAT 2019: Candidates who completed the application process and have submitted the application fee can download the BITSAT 2019 admit card by using their login credentials. To download the admit card candidates can follow the steps given below. Candidates need to first visit the website bitsadmission.com and click on the admit card link given. To download the admit card candidates need to enter their application number, gender, date of birth and email ID. The admit card will be displayed. Candidates must take a print out of the admit card for reference. The admit card of BITSAT 2019 is an important document to be carried on the day of the exam along with valid ID proof. Candidates must note that the details related to the examination will be mentioned on the admit card. As per the process, candidates had to first book a slot for the examination. Only after completing the slot booking process- test date and slot (time) candidates will be able to download their admit card. Candidates must note that those who are yet to complete the slot booking can do so through the link given on the website.